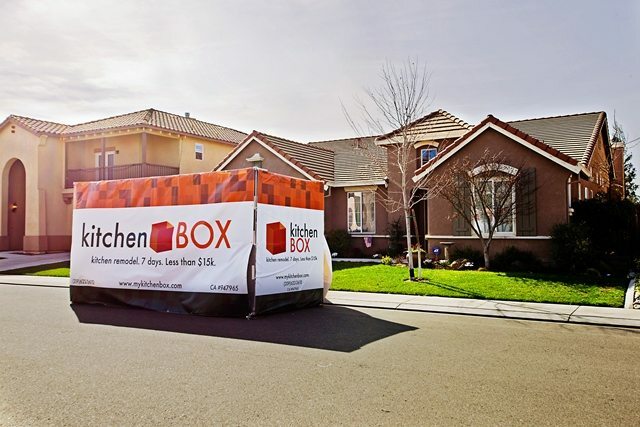 kitchenBOX West Tokay Street Begins in Lodi, CA! KitchenBOX is heading back to Lodi this week as we start renovating this 1990 home! We look forward to seeing a dramatic transformation, from granite countertops to tile backsplash to a completely different look on the cabinets. We can’t wait to share the results in just a few short weeks! Scroll down to read about what’s going into this project and see all of the before images. After spotting our ad in San Joaquin Magazine, this homeowner immediately called for an estimate. We were happy to oblige, and in just a few weeks we were on our way to Hayward to choose her exact granite slabs, and a few weeks after that: project start! This kitchen is an ideal fit for kitchenBOX: The previously-painted cabinets were long overdue for a facelift, and the white tile countertops with dark grout were a constant source of annoyance for the homeowner. By the time you read this post, the countertops will be long gone and the cabinet doors and drawers will be awaiting their entrance into the spray both in Ceres, CA. Countertop and Backsplash: White 4″ square tile with brown grout. Cabinet Finish: Painted cabinets in need of refinishing. Cabinet Hardware: Aged pulls and hinges. Lighting: 1980’s fluorescent light box. Like so many of our recent kitchenBOX clients, this homeowner elected to add 7 – 5″ LED can lights to their project. These energy-efficient, high-output, cool-to-the-touch lights are a fantastic addition to any kitchen. Refinish the cabinets, doors, and drawers in Kelly-Moore Whirligig Geyser in semi-gloss finish using a top-of-the-line Kelly-Moore Dura-Poxy paint. Fabricate and install MSI Giallo Ornamental granite countertops with a mitered edge. Supply and install Bedrosian’s Mediterranean Beige 3″ x 6″ travertine tiles with an accent of Bedrosian’s Manhattan Glass Mosaic Tile in Midtown. This will all be grouted using Laticrete Almond grout. Install a new double-equal Kohler Executive Chef under-mount sink in White. Remove original recessed fluorescent light fixtures and replace with 5″ LED can lights. Bring a new gas line from the fireplace to convert the electric range to gas. Want to learn how we can help you renovate your kitchen? Just click here to schedule your phone consultation using our online scheduling system. Or feel free to email or call us to speak to a CRATE team member at (888) 995-7996!